Venice 5-pc. 54" Glass Counter-Height Dining Set This Venice 5-pc. 54" glass counter-height dining set combines the small-scale coziness of casual dining with a more formal feel. The table features an elegant tulip base and a beveled glass tabletop that provides an open, airy feel. Plus, the easy-to-clean, faux leather chair seats provide a luxurious look. This Venice 5-pc. 54" glass counter-height dining set combines the small-scale coziness of casual dining with a more formal feel. The table features an elegant tulip base and a beveled glass tabletop that provides an open, airy feel. Plus, the easy-to-clean, faux leather chair seats provide a luxurious look. Every time I vacuum I am find screws on the rug that fell off the chairs. One of the chair became very wobbly. my husband found some screws missing from that chair- must have been the one I was finding on the rug. I called Customer service and they will send someone to look at it. I have a feeling in a few months I may have to buy new chairs. The glass seems very east to scratch too. I am finding long deep scratches on the glass and this is normal use no cutting or unusual activity takes place on the glass..
We have this dining set in our breakfast nook. It looks very elegant and is comfortable. We get compliment every time. MY DAUGHTER AND I LOVE THIS PRODUCT!!!!! Very Nice! Enjoying it to the fullest!Love the height! This chair sets is so beautiful, I have absolutely no regrets in purchasing it. In addition customer service was excellent. I would recommend this purchase to anyone looking for something simple yet classy. Perfect Additon to my home! Love it; it fits perfectly in my home. I love my dining set and chairs in my dining room it looks beatiful. 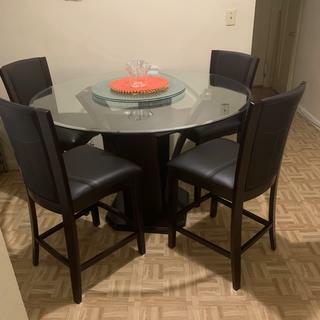 We purchased our Dining High Top Table Set and we love it. It looks beautiful in our kitchen and we are receiving a ton of compliments. Nice design and perfect height to accommodate 4 people. Very good table and it’s good for 4 people. This dining set was a great buy! The table is the right height and the chairs are comfortable and sturdy!!???? This dining set is beautiful. I love the height of the table and the chairs are very sturdy. ???? I love the dining room set.. The chairs are comfortable..I just didn’t realize how large the glass table was. Is there a sideboard that goes with this set? BEST ANSWER: We offer a variety of options that you can choose from both online and in our showrooms. You have the ability to book a free consultation with our design services: https://www2.raymourflanigan.com/free-consultation.html. We would love to assist you with your home furnishing decisions! I am interested in only purchasing the table base as I have a quality glass table now. Is that possible? BEST ANSWER: You could, you would just need to place your order by phone or in a showroom. The 54’ table looks small in the picture online..Is the glass round table 54’? BEST ANSWER: Yes the glass round top is 54"
Yes it is 54” and it is a really nice set. Can I buy two additional chairs separately? I have counter seating in my kitchen and I'd like it to match. BEST ANSWER: Yes. The Venice Counter-Height Dining Stool is available for individual purchase. The SKU is 711071011. Do I get a better price if I pay the whole thing? BEST ANSWER: We would be happy to assist you with pricing. Please contact us at 866-383-4484 option 3. In how long it's this product available? BEST ANSWER: There is no way to know for sure how long we will carry an item. There are many factors involved, such as how well it sells, and if the manufacturer continues to carry the item. BEST ANSWER: No, this is manufactured by Homelegance. I want a 60" round table, are there any that can be ordered through Raymour and Flanigan? BEST ANSWER: It is possible that a 60" round table could be special ordered exclisively through your local Raymour & Flanigan store. How many seats doe the 54" counter height dining set fit? Can I put more than 4 chairs? If not Does this set have a large table? BEST ANSWER: The 5-pc set will come with the table and 4 chairs. You could comfortably fit 5 seats around the table, 6 would be a tight squeeze. The Venice is available in 48" or 54" only. To see if a larger table top can be ordered, please contact your local Raymour & Flanigan showroom to see if that's something they could special order for you.